This geologically diverse region in France produces some extraordinary wines. The amazing point is that you can find stellar, rare and costly wines in this area, but there are many little gems to be had, also. We're amused that many California winemakers put price tags on their wines which exceed those found on some of the wines which are viewed as "the standards. " Wines from the Rh�ne used to be viewed as price-worthy alternatives to Bordeaux and Burgundy when those markets spiraled to dizzying levels. This situation has changed in the past decade as superstar Rh�ne Valley wines now achieve prices as high as top Bordeaux and Burgundy. The main grape varieties here are the Grenache and Syrah for red wines, Viognier, Roussanne and Marsanne for whites. I've listed the appellations and the grape varieties allowed for each. They're listed north to south. 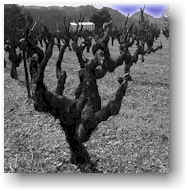 While a major player in southern Rh�nes, Grenache is not normally found in the north. with a 20% maximum of Viognier being allowed, though rarely employed. SAINT-JOSEPH Syrah for the reds with 10% maximum of white grapes allowed. SAINT-PERAY Marsanne & Roussanne for both white wine and a Rh�ne sparkling wine. CROZES-HERMITAGE Syrah for the reds with 15% maximum of white grapes allowed-rare, though. The Southern Rh�ne is quite variable, the second largest regional appellation after Bordeaux. 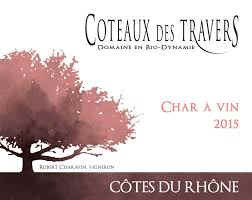 The most broad appellation here is "C�tes du Rh�ne" and you'll find it on some wines ranging from very good to remarkably average. 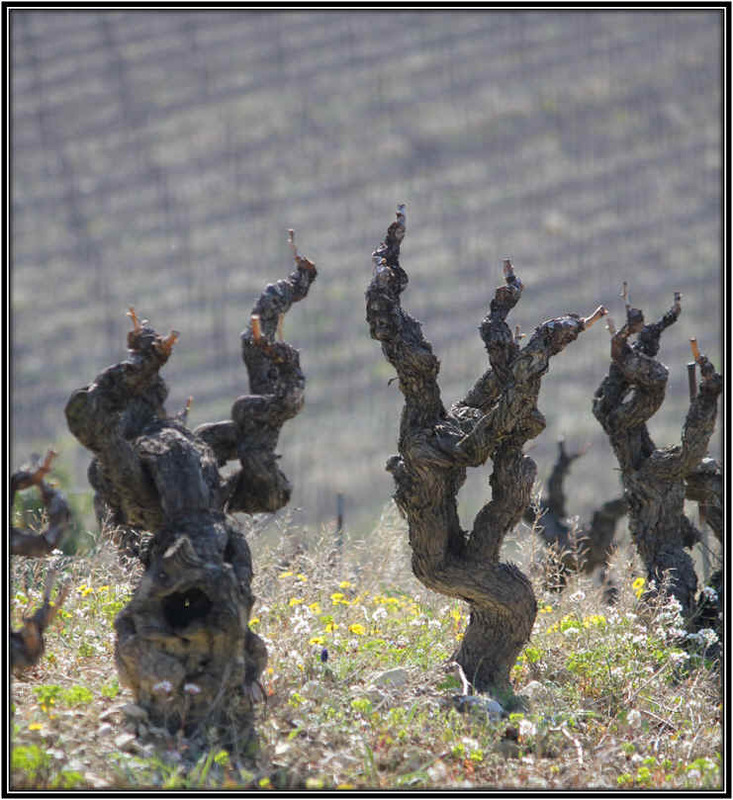 There are some 77 or so little "burgs" which come under the appellation of "C�tes du Rh�ne Villages". Of those, some 16 can actually put their village name on the label. 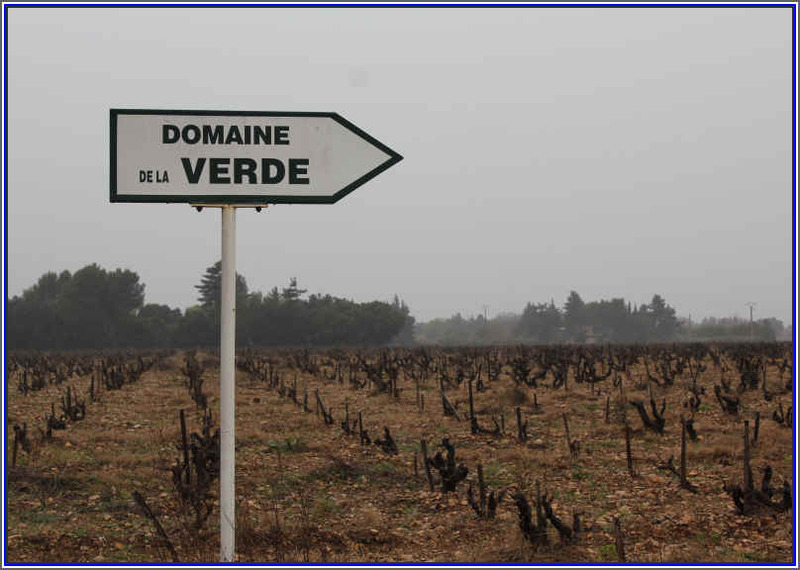 We've recently found good wines of the Costieres-de-Nimes, Coteaux-du-Tricastin and C�tes-du-Ventoux designations. The most prestigious southern Rhone appellations are the world-famous Ch�teauneuf-du-Pape, followed by Gigondas and then Lirac and Vacqueyras. Tavel is a famous and, usually, expensive rose wine. Most of the southern Rh�ne reds are Grenache-based wines. Quality and character are variable, depending upon the location of the vineyard, soil type, vintage and vigneron. 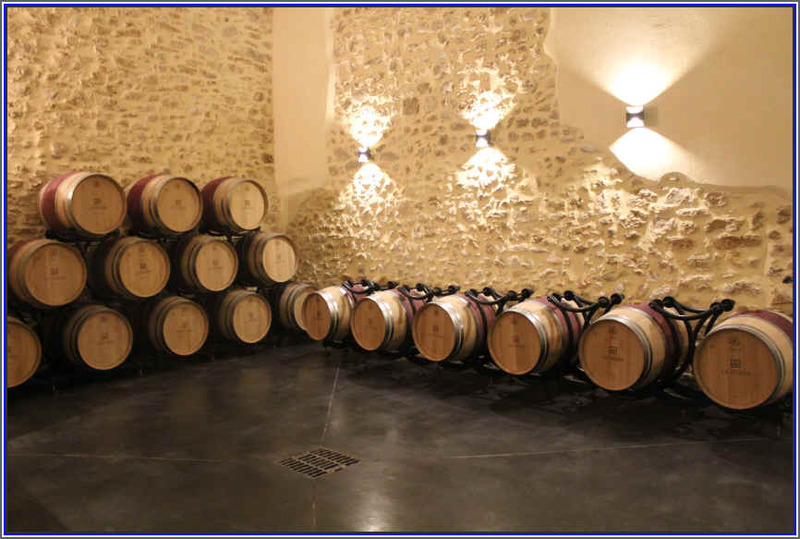 There are 13 different varieties allowed in producing wines such as Ch�teauneuf-du-Pape. Grenache Noir, Syrah and Mourv�dre are the primary varieties, augmented with Picpoul (which comes in 3 "flavors": noir, blanc or gris), Counoise, Cinsault, Clairette, Terret Noir, Vaccarese, Roussanne, Bourboulenc and Piccardin. You might also find a herd of others in the south, including Carignan, Grenache Blanc, Ugni Blanc, Marsanne, Viognier, Camarese, Pascal Blanc, Grenache Gris, Clairette Rose and something called Calitor. Winemaking in this region varies from rustic to ultra-modern. 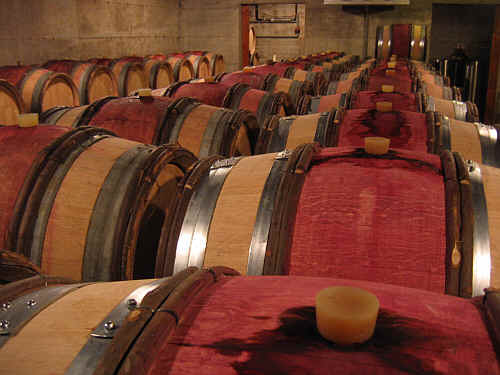 While we've seen cellars here with 60-gallon capacity oak barrels, the percentage of wines with significant amounts of new oak is rather small. 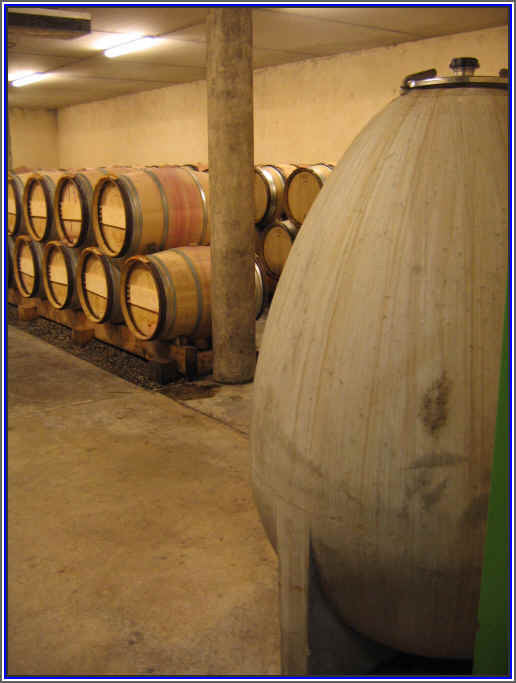 Most winemakers attempt to showcase their fruit rather than the work of a barrel-builder. Recent vintages have been reasonably good. There is not a shortage of good Rh�ne wines at the present time. We've long admired the wines of Guigal, first visiting the winery back in the early 1980s. We stopped in again recently and, despite our poor timing (the harvest was just winding down), both Marcel Guigal and his son were extremely hospitable. The company has grown considerably over the past decade, or so, thanks to the high standards of the Guigal family. It's not by accident these wines have gained a wide audience. Of course, C�te-R�tie here is the specialty, Guigal owning several prime parcels. These are labeled "La Landonne", "La Mouline" and "La Turque" and fetch amazingly high prices. Some potential buyers view these as commodities, not as wine. Prices, as a result, have become astronomical. We have the 2004s in stock. $299.99 per bottle. Now a large producer of Condrieu, Guigal's special bottling is tabbed "La Doriane" and has been exceptional Viognier. La Doriane is matured in wood, so it's got the peach-like notes of Viognier, plus the sweet vanillin notes of the new oak barrels. Photo: A Zander filet (a type of perch) served on a bed of vegetable confetti seasoned with curry. This was a sensational plate prepared by Norbert & Gaby. Guigal has introduced a new C�te-R�tie called Ch�teau d'Ampuis. We were impressed by the fruit, spice and sweet oak of the 1995, the inaugural vintage. The wine continues to be a delight. The 2006 is in stock and it's a major league, very showy Syrah. The local importer recently landed some bottle of Guigal's 1997 C�te-R�tie and we bought one, curious to see how this has matured. Well, in April of 2008 the wine is still deep and youthful in color. It's aromas are young, too and the wine is quite full and vigorous on the palate. I would not have guessed it to be a ten+ year old wine from such a warm vintage. I suspect it may cellar nicely for another decade. Maybe more. We're big fans of the Saint Joseph bottling called "Vignes de l'Hospice." This is a magnificent Syrah from two vineyard sites. It's made entirely of Syrah and the wine spends two and a half years in brand new oak barrels. This contributes a magnificently sweet, woodsy quality to the nose and palate. The wine is supposed to retail for $135, but we've got it sale tagged presently at $109.99. It's drinking well not, especially if you like lavishly oaked Bordeaux and can imagine that mixed with some dark blackberry fruit and a hint of wood spice. This is amazing. Limited, though. Guigal was once highly-regarded by young, hip sommeliers and wine geeks. Theirs was the label of those-in-the-know. Now, perhaps 20 years later, the label is no longer viewed as being "cool" and the brand is viewed by those folks as akin to Silver Oak-from-the-Rhone. 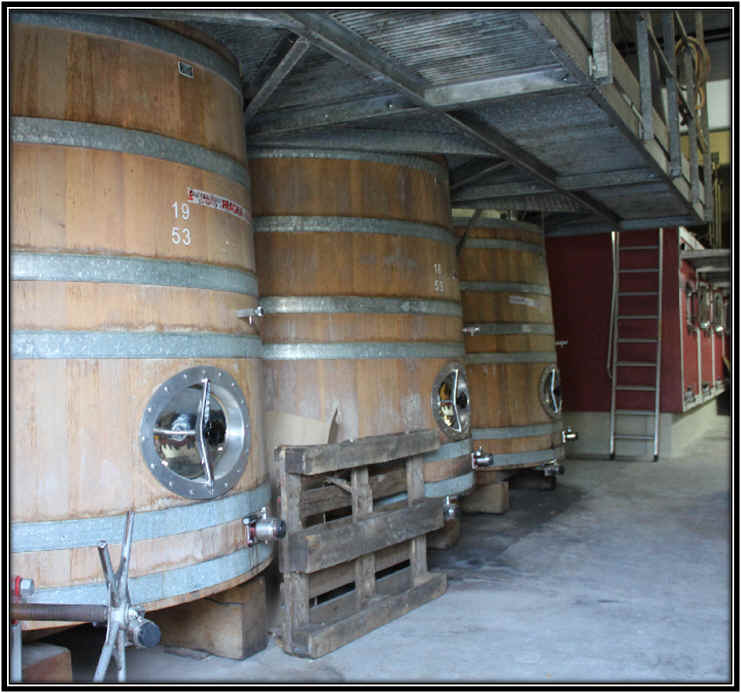 A rather tiny property, this firm is located in Ampuis and produces a few bottles of Condrieu and a few more of C�te-R�tie. 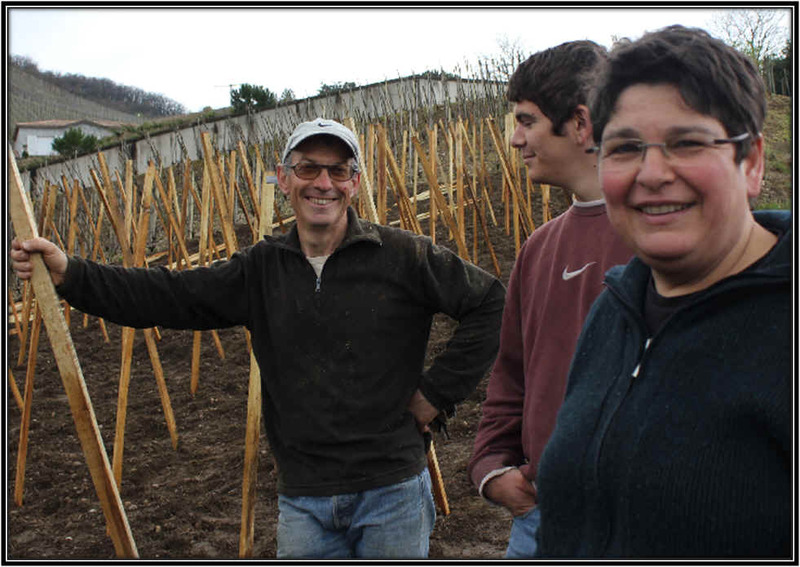 Run by Gilbert Clusel and Brigitte Roch, they have something like 3 hectares of Syrah vineyards and a half of a hectare of Viognier. Their son is now part of the firm and he's renting a couple of parcels of Gamay near Lyon, hence the new sign (depicted above) with the notation of "Lyonnais." 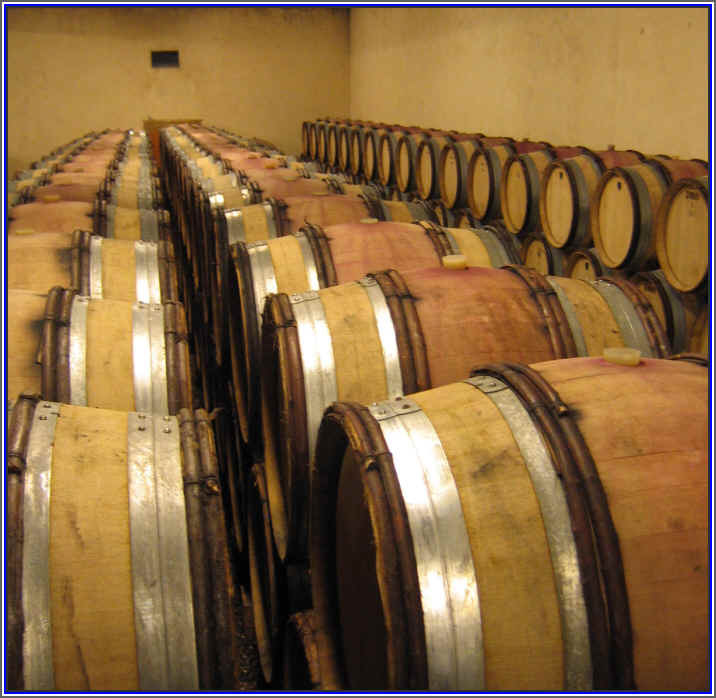 The C�te-R�tie sees time in new wood and seasoned cooperage to achieve a balance and highlight the spicy, bacony Syrah fruit. If you taste a really young bottling, the wine "merely" shows dark fruits...it takes a few years of aging in the bottle for the wine to develop and blossom. 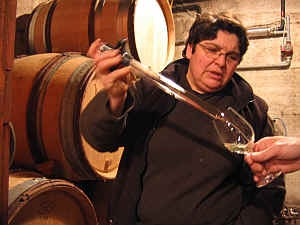 Brigitte opened a couple of bottles of their 1999 C�te-R�tie wines for us in 2008. These were, frankly, superb. Best wines of my French visit, in fact. I tasted their 2002 vintage and, despite it being a tad light, the wine was thoroughly delicious! We currently have the 2003 in stock. This is a nicely done wine and it's drinkable now, if you like. I suspect it will continue to develop for a few more years and maintain on a plateau through 2015, or so. I don't find it to show as much wood as did earlier vintages. They make an even tinier amount of Viognier from the Condrieu appellation. This is a really fine example of Viognier and it sees a bit of wood. The wine is peachy, dry and has a mild woodsy note. 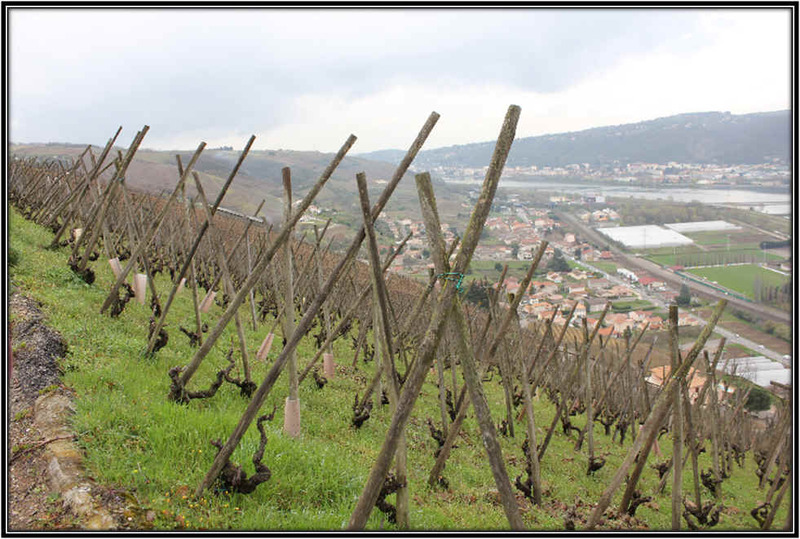 Moving from Paris to the northern Rh�ne in the mid-1980s, Graillot has become the leading producer of Crozes-Hermitage wines. Graillot had been a fan of the wines of Guigal, Jaboulet and Grippat, so when the opportunity for a new career path became available in 1985, he took it, renting a vineyard in Crozes-Hermitage. Now he owns these vineyards and he's a major luminary in the French wine scene. His early vintages were quite good, putting him at the head of the class. His wines today are as good as ever. Graillot farms about 21 hectares of vineyards, mostly in Crozes-Hermitage, though he does have a small holding in Saint Joseph, as well. Today Graillot's wines are regarded as a bit of a benchmark for the appellation, though his neighbor (and buddy) Laurence Combier also makes remarkably good wines. The 2011 vintage of Crozes is quite good. This is a deep, dark Syrah with tremendous Syrah fruit and spiciness. Plummy. Dark berries...blackberries...It's showing beautifully today with nice spice notes and a dark berry fruit. 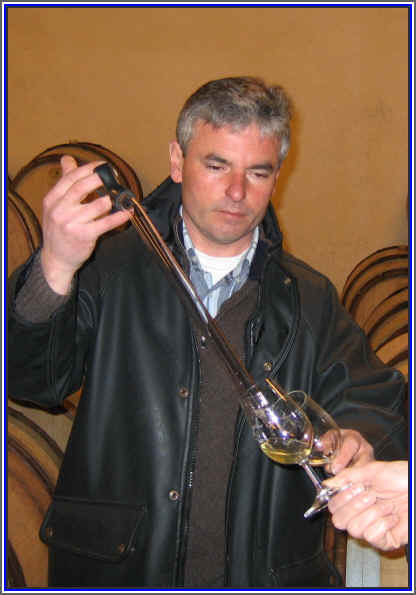 Graillot makes a special bottling, selecting his favorite barrels for this wine. It is labeled "La Guiraude". We periodically have this in stock...it's allocated and we're fortunate to receive a few bottles from time to time. 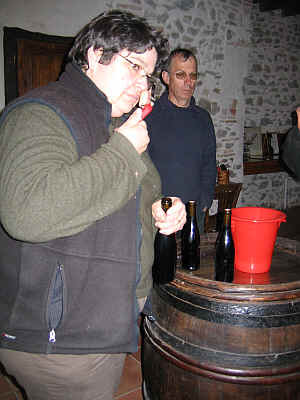 Winemaker Laurent Combier is, for us, one of the rock-stars in Crozes-Hermitage. Ages ago, the leading light was his old school friend, Alain Graillot. Having followed both winemakers over the past 10-15 years (or more), we give the nod to Combier. The family has been in the Northern Rh�ne for a few generations. Laurent's father Maurice had the relatively radical notion in the 1970s of cultivating the fruit orchards in an organic fashion. The neighbors thought he was out of his mind and dubbed him Maurice Le Fou. But after seeing (and tasting) the magnificent fruit he was producing, others took on the same fou notion as Mighty Mo. Or should we call his "Mo Co"??? When Laurent was old enough to join the family business, he first attended winemaking school and then did a couple of internships. One was in the Southern Rh�ne and the other in Provence. Coming back home, he convinced Mo-Co that they ought to make their own wine instead of selling all the grapes to the local grower's co-op in nearby Tain. So, since the late 1980s or early 1990s, Combier has been a small production domaine but with good quality and honest prices. These days they still have fruit orchards to the tune of 25 hectares. And there's another 25 of vineyards which are also organically farmed. 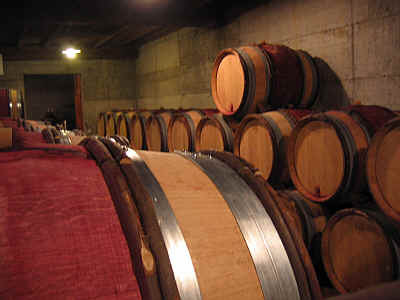 And they have a spacious cellar for vinifying, aging and sotring their wines. Laurent is a fan of Burgundy wines and he says he wants his wines to have the elegance and finesse of wines made of Pinot Noir. Of course, Syrah is Combier's main grape, along with Marsanne and Roussanne. By the way, he's in a partnership with two other French winemakers. They have a wine production in Spain's Priorat. There he's involved in producing wines made of Grenache, Syrah and Carignane. Combier, by the way, has his pilot's license so he and his winemaking buddies periodically hop in the plane and fly (maybe 3 hours, or so) to Spain. 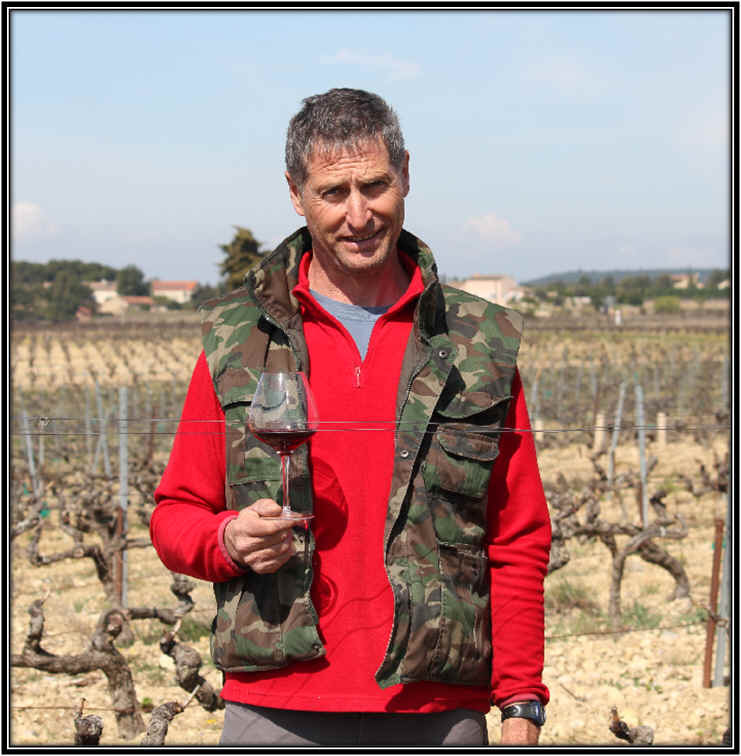 We prefer his French wines, though...these are seriously good and we think he routinely hits the mark in making elegant wines capturing the essence of Northern Rh�ne Syrah. Combier makes a lovely entry-level Syrah from vines owned by a friend of Combier's. The fellow now rents the vineyard to Laurent, who's farming it organically and making this remarkably charming Crozes-Hermitage from relatively young vines. It's vinified to be drinkable in its youth and, oh yes...is it drinkable! 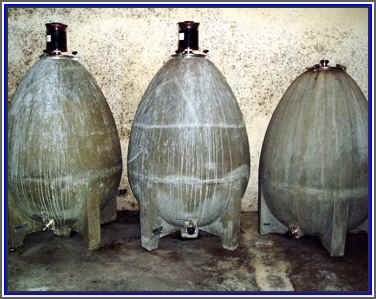 It's matured in concrete "egg"-shaped tanks. Combier had just purchased these when that snapshot (above) was taken. He was experimenting with that tank and now has fully embraced them. The 2016 Laurent Combier Crozes-Hermitage is currently in stock. It's got a youthful color and the fragrances are spot-on Northern Rh�ne Syrah. We like the red berries, hints of green olives and tapenade as well as the subtle pepper and spice notes. It's a medium-bodied red, not a full-throttle Syrah as Combier's idea for this is that his restaurant friends should be able to pour this by-the-glass in their nearby (to the winery) bistros. Initially he made barely enough for them, but these days he's got a larger quantity and can send some to his fan club members here in Burlingame. 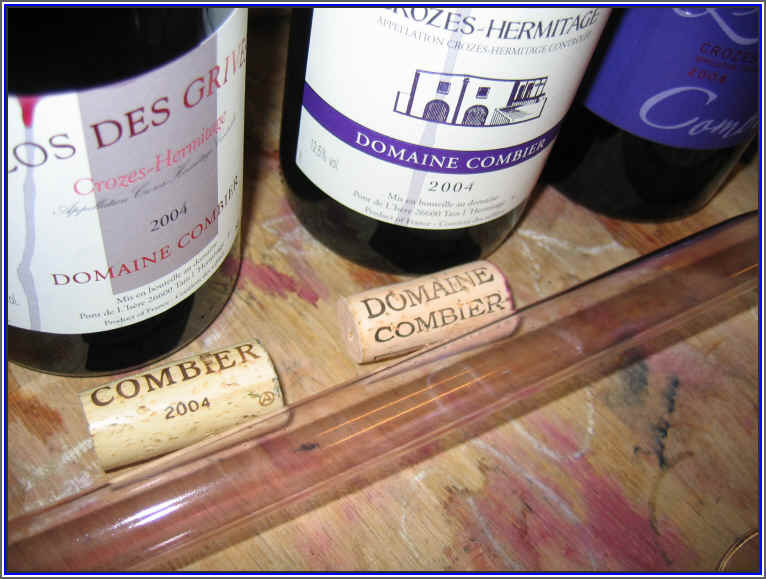 The main bottling of Crozes-Hermitage is labeled as Domaine Combier. It's entirely Syrah (they can blend in up to 15% of the white grapes, Marsanne and/or Roussanne) and this is matured in seasoned oak so as to not cover the marvelously berryish and spicy notes of the grape. We have enjoyed this in its youth as it tends to be more precocious than a lot of (higher priced) C�te-R�tie and Hermitage wines. In the realm of $30-$40 French wines, this is a star. We have a few Burgundies and Bordeaux that are similarly-priced, but Combier's is one of the best buys. Pair this with duck or lamb and do give it perhaps 30 to 60 minutes in the 'fridge to bring it down to cool cellar temperature. It's a terrific wine in its youth and can cellar well for 5-10 years. We sold our remaining bottles of Combier's "Clos des Grives," his older vines bottling from a smallish parcel that's the centerpiece of his winemaking. The vineyard produces a lower yield and the wine is fuller-bodied and more concentrated. The wood treatment seems a bit more lavish, so you may not like the wine if you're allergic to oak. We requested a taste of the newest vintage, so watch this space...we'll leave some tasting notes. This domaine has been owned by the Camallonga family since 1963, but it was producing award-winning wines back in the late 1800s. In fact, the La Verde wine entered in the 1889 Paris Worlds Fair, the fair for which the Eiffel Tower was built, a gold medal was bestowed in its entry. One particular item for this estate is the vineyards are in one parcel. It's 26 hectares and the vines are what we used to consider "elderly," but now that we qualify for the "senior discount" at the movie theater, we have a different perspective. The Camallonga family came to the town of Sarrians in the Southern Rh�ne from Algeria and they were not new to winemaking. The clan is of Argentinean and French heritage, so there's winemaking in their blood. The family had some help from a neighboring winery in vinifying its grapes. But their friend soon found he had his hands full making wines from his own vineyards, so eventually they were on their own. Wine was mostly sold in bulk at that time. 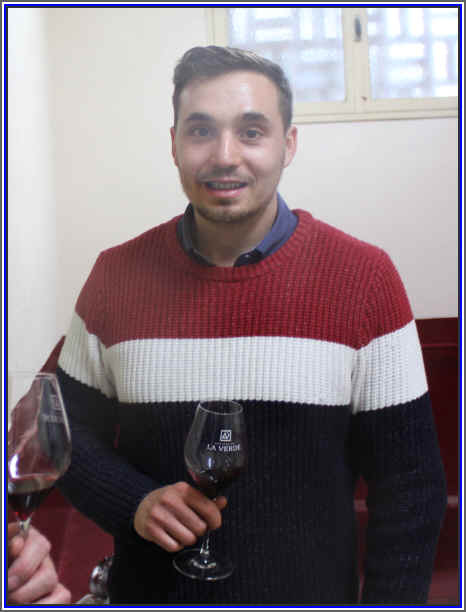 The new generation of the Camallonga family, young Nicolas, finished his studies in both winemaking and marketing. He needed customers if the estate was to bottle its wine, so he contacted our importer friend who had purchased La Verde wines ages ago. We happened to be in France as our importer friend was evaluating the wines. It's a normal wine cellar...cement tanks, stainless steel tanks and some nice barrels. 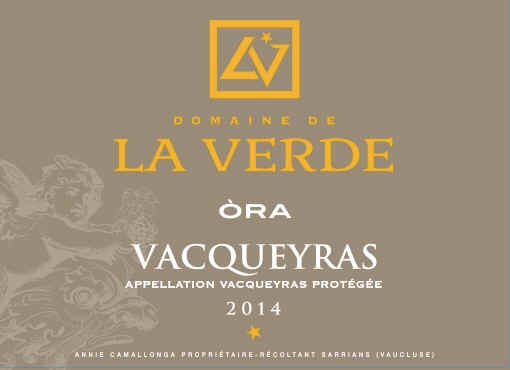 We have had La Verde's 2014 "Prelude" Vacqueyras in the shop...it's Grenache-based, of course with 23% Syrah, 12% Mourv�dre & 10% Cinsault in the mix. You'll find it to be a medium-bodied wine with some of the red fruit notes and slight spice tones typical of Southern Rh�nes. It's immediately drinkable with a few years of aging potential, but not a wine that will show much development in the bottle. Truly exceptional is this special bottling of Vacqueyras called ORA. 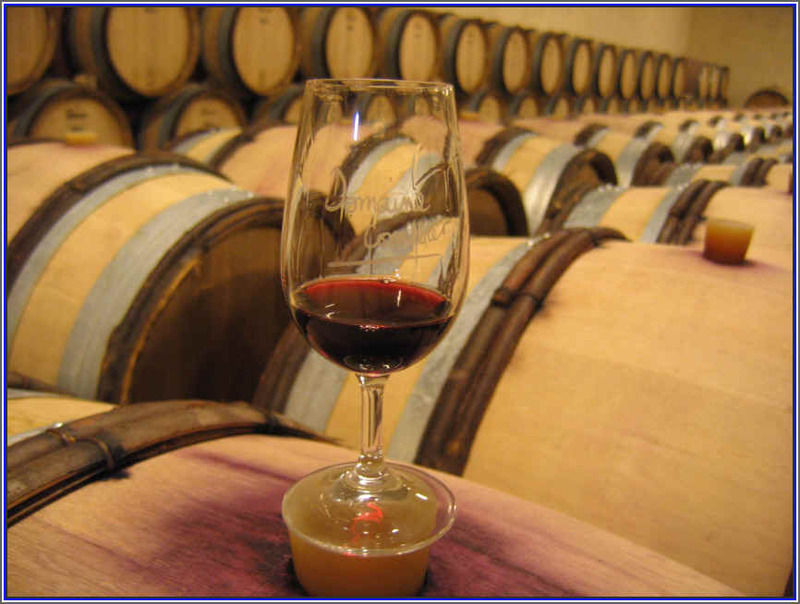 It's got 25% Syrah and 20% Mourv�dre and some of the wine sees time in barrel. This is also from the 2015 vintage. We find this a bit more robust and perhaps a shade less elegant than the previous vintage. It's medium-full bodied and rather supple on the palate...even smoother with food. The wine is ideal for winter-time cuisine...braised or stewed meats especially. Robert Charavin's grandpa Elie began selling his wines in 1931 and when World War II ended, the domaine found even more success. In 1976 they discovered wine bottles and corks and began employing both. Soon customers were coming directly to the cellar door in beautiful downtown Rasteau (well, close to what passes for 'downtown' in the sleepy village of Rasteau) and carrying away bottles and boxes of bottles to enjoy at home. Today the domaine comprises about 14 hectares, ten or eleven of them in Rasteau and the rest in neighboring Cairanne. The vineyards are quite mature, averaging about 40 years of age in most instances, with the oldest parcels being around 90 years old (Merci beaucoup, Grandpa Elie!). Robert told us in 2011 that he'd just acquired a nice patch of 70 year old Carignane vines. 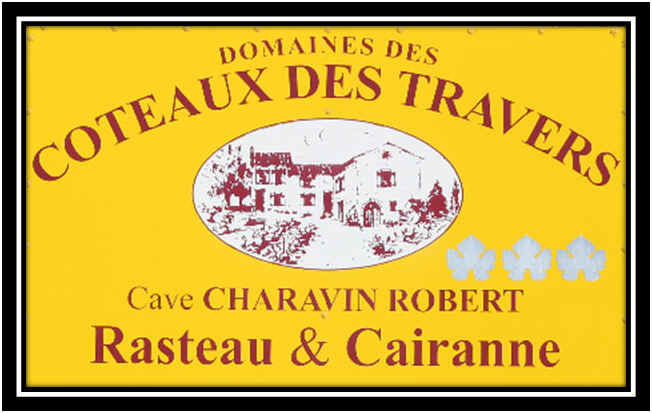 The soil in Rasteau tends to be mostly clay, while his vineyards in Cairanne tend to be a mix of clay and sand. We've been fans of this winery for a number of vintages now. The wines are routinely of really fine quality, well-made and showing "precision"; precision in their viticulture, precision in their vinification and precisely balanced, too. The vineyard are now being farmed biodynamically, but Charavin doesn't make a big fuss about this. Many vintners crow about their organic farming, but Charavin has long had respect for the vines and has cultivated in a "responsible" fashion for many years. These days it's a marketing point for many producers and Charavin seems to prefer to let his wines do the talking for him. Though he makes good white wine, it's his Rasteau rouge which is especially appealing. 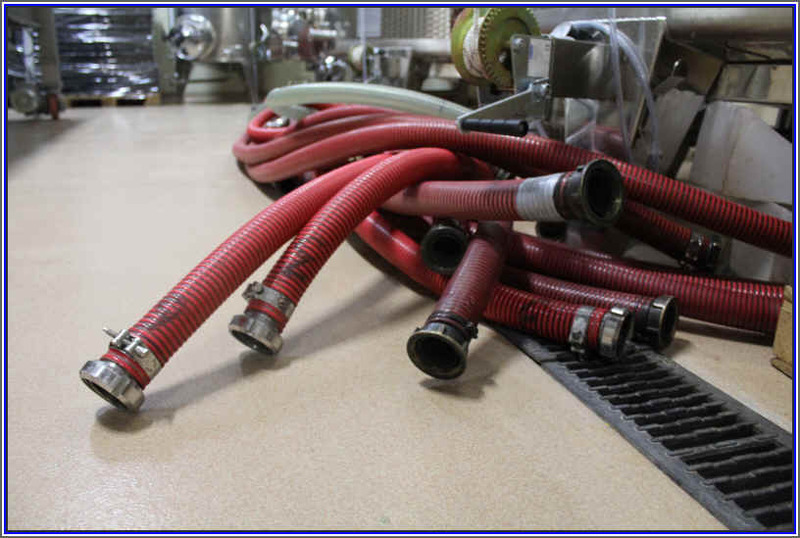 "For the red wines, my fermentation is like that of a ros� for the first 6 to 8 days. I like to start with a cool fermentation, so it's around 16 to 18 degrees Centigrade. Then I let it rise so we obtain good color, but starting it somewhat cool provides especially fine aromatics." Charavin explains. The 2014 Rasteau is presently in the shop. It's roughly 60% Grenache, 30% Syrah with 10% Mourv�dre. As usual, it's a fine bottle...deep in color, teeming with fruit and a touch of spice. It's delightful in its youth and should be good for several more years. We recently added Robert's everyday C�tes du Rh�ne to our selection of "good value" wines. This is a bit lighter than his Rasteau. It's 60% Grenache and 40% Syrah. The grapes are de-stemmed before the fermentation so as to reduce the tannins and make a wine that's more immediately drinkable. Lots of red fruit notes here...no oak...a touch of spice and a modest price tag make for a nice little wine. 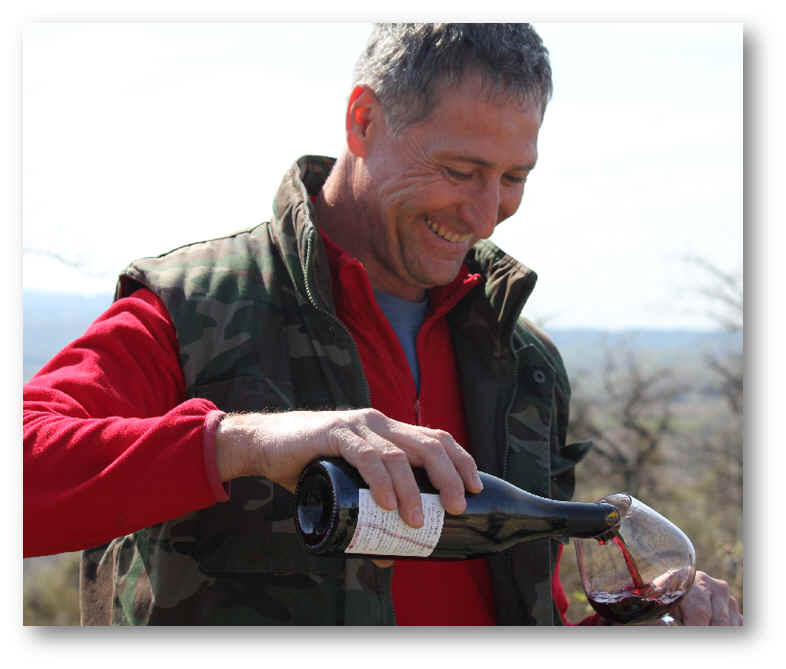 You'd be smiling, too, if you made wines as good as Charavin's!